Seiryu - Tenkara - Keiryu - Continuum - Part II offers further thoughts on rod actions, particularly matching stiffer rods to heavier flies and larger fish. I still get questions and see comments on various forums about whether a certain rod is "tenkara" rod, but the tone seems to be changing. 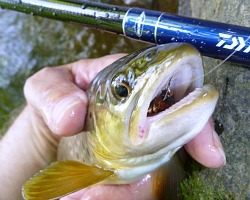 I was recently advising a customer on a rod choice and he asked me if in Japan the rod under discussion was considered a tenkara rod (it wasn't). He didn't buy it - but then he did buy another rod that also wasn't a tenkara rod. Good thing, too, because what he wanted the rod for wasn't tenkara - or at least nothing the Japanese would recognize or accept as tenkara. He is not alone. I think we should all just accept that the way most of us fish is not tenkara as defined by the Japanese masters. There was a poll not too long ago on the Tenkara USA forum. An overwhelming percentage of those who responded admitted to using weight, either weighted flies or split shot (or both), at least some of the time. Not only is that not traditional tenkara, it is not something that traditional tenkara rods do particularly well. If a similar poll were held in the UK, I strongly suspect that nearly everyone would admit to fishing "the duo" - which is also very clearly not tenkara as defined by the masters. In the first part of The Seiryu-Tenkara-Keiryu Continuum, I spent a bit more time talking about the seiryu rods. I suppose it is because I really like the feel of the lightest possible rod and lightest possible line. For those anglers who love fishing for wild trout in the headwaters, where the trout are likely to be only 4-7", the seiryu rods are just ideal. There are guys at the other end of the spectrum, though, who love plumbing the depths of pools and runs in larger streams, angling for hook-jawed browns. When I first got a tenkara rod I thought it ought to be great for Czech nymphing - you know, the longer rod, the shorter line, the reel you don't really use. I was quite disappointed to learn that it didn't work all that well. The tenkara rod tip was soft enough that it was difficult to effect the quick, sharp hookset that was necessary to overcome the resistance of the line deep in the water. I got a lot of hits but I missed a lot of fish. I very quickly stopped fishing tungsten, and I fairly quickly stopped fishing beadheads altogether. I didn't realize how much I missed short line, tight line nymphing - not exactly Czech not precisely Polish, but close enough. Fishing this past summer with the Daiwa Kiyose rods and Anthony Naples' Czech nymphs, my Killer Crane Flies, and more recently jd_smith's Euro-nymphs, kind of rekindled things. A few weeks ago, that flicker turned into a flame. I was fishing with a new rod, trying to decide whether to import it and offer it on the site. I'd have to say that catching the fish shown below with the new rod did influence my decision! 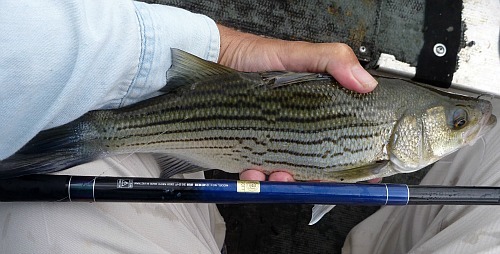 The fish was caught on a tungsten beadhead nymph, which would have been a bit heavy to fish effectively with a typical tenkara rod. The rod in question is not a typical tenkara rod, though, and it performed admirably. It will be available here on the site as soon as I can get the page written for it. On the same trip, I was able to catch another nice fish (also on a tungsten beadhead nymph) with a different rod, one stiff enough that you probably wouldn't want to use it for tenkara (that is, the narrowly defined tenkara as practiced by the masters in Japan). For bouncing beadheads along the bottom, though, it's as nice a rod as I've found. 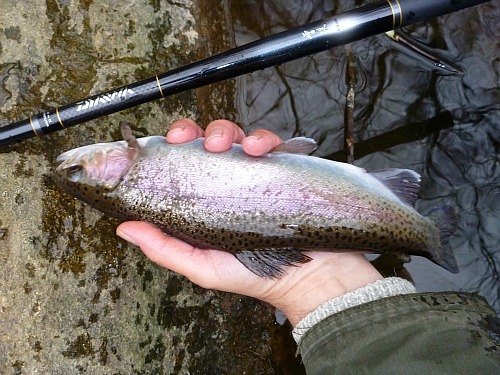 And if that's the fishing you want to do, you'll want to do it with a rod that is stiffer than most tenkara rods. I thoroughly enjoyed the day (despite it being bitter cold). I felt like I'd come full circle. And as much as I like the incredibly light weight and extreme suppleness of the seiryu rods, I do like the authority that a rod with a bit more backbone provides. The additional backbone that allows the rod to effectively fish weighted nymphs also allows it to stand up to good sized fish even when there is a bit of a current to contend with. And if you are fishing on or near the bottom, you'll probably catch larger fish, on average, than if you are fishing near the surface. For fishing weighted flies or wind resistant flies or fishing for larger fish, there is a whole range of rods you'd never even hear of if you didn't read about them here. Oh, there was one very brief mention in a video, once, in which they were hastily dismissed as rods for bait fishing. Seriously, if you blinked you would have missed it. They are the keiryu rods. Catching larger fish on weighted nymphs in current is something that tenkara rods are not designed for. Keiryu rods are. In Japan, they are typically (but not exclusively) used for fishing with weight, generally small shot, and with a baited hook. Whether the hook holds a real nymph or an artificial nymph is not the critical difference. Whether the business end of the line has added weight is. Tenkara rods are designed for fishing unweighted flies in the top few inches of the water column. If you want to fish deeper, you probably want a keiryu rod. Most of the time there is not going to be a convenient plunge pool. Americans' first introduction to a keiryu rod was probably the Daiwa Kiyose 30SF, which I described as a backpacking/nymphing rod because it was really a very good choice for both endeavors. I quickly sold out and haven't been able to get more, but I'd have to say I like the Shimano Kozuka better. They both have the stiffer tip that is needed for quick, sharp hooksets, and also the backbone for fishing heavier flies or more wind resistant flies. That they collapse to fit safely within a backpack (or carryon bag) is an added plus. More recently, I got in the Daiwa Kiyose 43MF, which zooms from about 12 1/2' to 14' and which effectively replaces both of the tenkara rods that previously had been considered "big fish" rods. 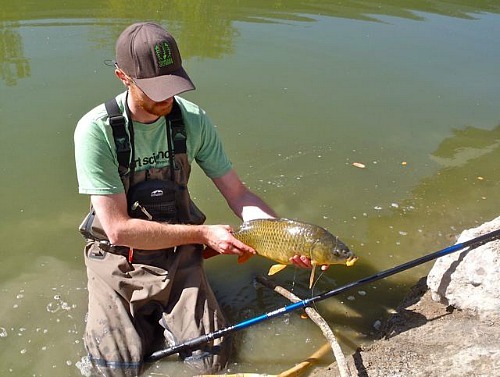 John Vetterli of the Tenkara Guides in Salt Lake City catches carp with his. His partner, Erik Ostrander, uses the Daiwa Kiyose 53MF. That is not something you want to do with your average tenkara rod! The other night I had a very nice conversation with a guy who is interested in a wide range of rods and wanted to find a better way to compare them than the 5:5, 6:4 and 7:3 ratings. Aside from the fact that the ratings are entirely subjective and not at all scientific, I have also found that the ratings are not consistent from one manufacturer to the next. Compare a 7:3 rod from Nissin with one from Daiwa and one from Tenkara USA and you will not believe that they could all be 7:3. To the guy I was talking to, what numbers get painted on a blank matters not at all, what matters is how the rod will hold up to large fish (and the guy does catch large fish). I suspect he is looking for a better rating system because he has broken more than a few tenkara rods (although none of the rods he has gotten from me). I would not be terribly surprised if he gave up on tenkara rods altogether - but not on tenkara. Or at least, not the way he defines it and not the way he fishes. The way he fishes, at least quite a bit of the time, would not be considered tenkara in Japan. Throwing big ugly terrestrials and big streamers for big trout in big rivers isn't tenkara (or at least it isn't tenkara as practiced in Japan). It is very productive and a real kick in the pants to connect with fish that are longer than your rod (when it is collapsed, of course!) and which pull against your rod and not your drag. No, he is not going to give that up - and he won't have to. There are rods that are really very well suited for that type of hand to fin combat. They just aren't "tenkara" rods. More and more people are beginning to realize that the type of fishing we do here in the US (and in the UK and Australia, and...) isn't the type of fishing they do in Japan. A guy I know asked some Japanese tenkara anglers how they handled large fish, what rods, what techniques, etc. Their answer was, to be blunt about it, "We don't catch large fish." If you do catch large fish, or if you want to, I would humbly suggest finding your own path. You might also want to find a keiryu rod. When I first wrote the Seiryu-Tenkara-Keiryu Continuum I had fished with only a limited number of keiryu rods and did not realize how much diversity there is among keiryu rods. Most of the rods I'd fished with then were on the stiffer end of the spectrum. For several years now I have been fishing with keiryu rods on the lighter end of the spectrum. The Continuum is even smoother than I had thought originally. The softest keiryu rods are softer than the stiffest seiryu rods! The "Zero" rods by Daiwa and the "ZPRO" rods by Suntech are designed to fish with small baits, small light wire hooks, and lines thinner than any tippet I've seen (and I sell 10X tippet - which is 1.1 lb test). You cannot fish a stiff rod with 1 lb test line! Not if you want to catch anything, that is. The Zero fishing style is extremely effective, as the bait achieves as close to a perfectly natural drift as you can get and still have it attached to a line and rod. 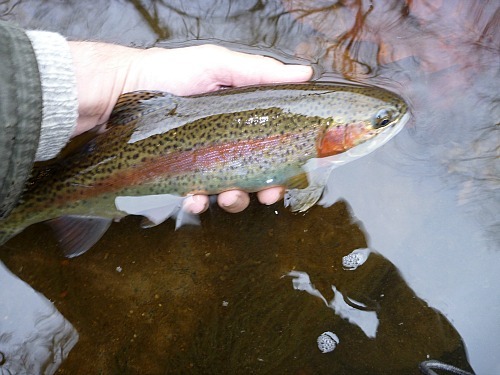 It is only good for relatively small fish, though, as any trout over about 10" can break the 1.1 lb line. For the right size fish, though, it is the ultimate in ultralight.